Wellerly Selfie Light iPhone 7 / 8 Case to Provide You a LED Illuminated Selfie Light iPhone 7 / 8 case to Light Up your selfies, Your life and anywhere, anytime! Warning!!! : This case is ONLY for the Apple iPhone 7 / 8 (4.7inch), not for iPhone 7 Plus(5.5inch) , and also not for any other phones. Please check your phone carefully to avoid buying mistakes. 1. Click once to Open/Close. 2. Long press the button to adjust and control the light intensity. 3. Double click the button to enter the flash mode；Double click again the button to enter the SOS flash mode；Double click again the button to enter the LED flash mode. 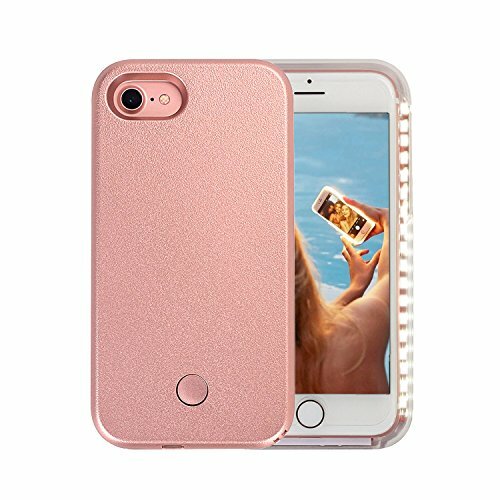 *This iPhone 7 / 8 Selife Light case is designed with slim, lightweight and stylish, easy to put it to your pockets as before. This case made with high-quality materials, and is impact resistant, it is perfectly protect your precious iPhone 7 / 8 from scratches, drop or bumps. *This case doesn’t use the battery of your iPhone 7 / 8, as it has its own built in rechargeable battery, and 1-2 hours charging time guarantees 5-6 hours working time. With dimmer control and adjustable lighting, you can have the perfect light for your surroundings faster and easier than ever. Wellerly selfie light case has own product package with "Wellerly" logo to distinguish the real and fake case. Features - Wellerly Selfie Light Case for iPhone 7 / 8 features built-in flashlight so you can always take beautiful selfies and Facetime, even when there is not enough light. With just one click the round button on you new case will offer you the bright light you need to capture great pictures. 5 Lighting Settings: 1. Click once to Open/Close LED 2. Long press button to adjust and control the light intensity 3. Double click the button to enter the flash mode；Double click again the button to enter the SOS flash mode；Double click again the button to enter the LED flash mode. Rechargeable - Comes with micro USB charging cord. Regardless of your phone's battery will always shine bright. Working Time - 1-2 hours charging time guarantees 5-6 hours working time. Enjoy your sefle time with excellent endurance ability. Great for - Selfie, Facetime, Movies, Camping, Lights up a Room. Wellerly selfie light case has own product package with "Wellerly" logo to distinguish the real and fake case. If you have any questions about this product by Wellerly, contact us by completing and submitting the form below. If you are looking for a specif part number, please include it with your message.